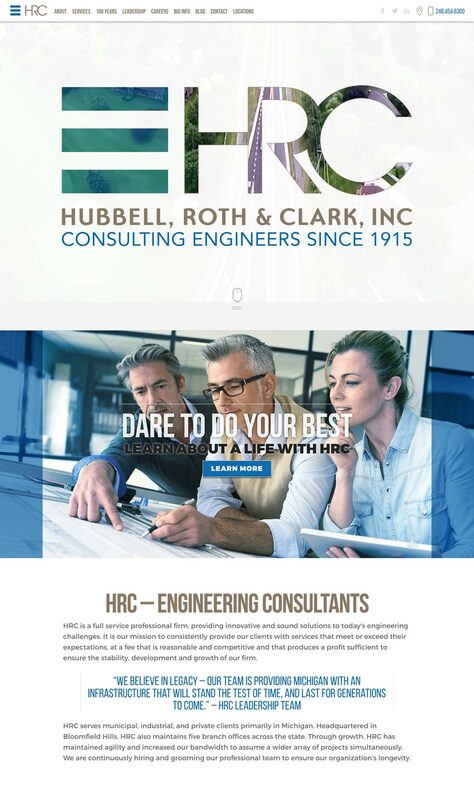 Hubbell, Roth & Clark (HRC) is an engineer consulting firm headquartered in Bloomfield Hills, MI. They have been in business for over 100 years, and are consistently listed as one of the top 500 consulting firms in the nation by www.enr.com. HRC’s website presence was tarnishing their overall brand perception to the public. The site was causing them issues in attracting both entry level and top-tier employee talent, and was not user-friendly for current clients or prospects. They were also seeking a CMS solution where they could manage bid information, author blogs, and make content adjustments internally as their organization deemed necessary without having to contact an outside resource. Design a web experience that is scalable to all devices - mobile phone, desktop, and tablet. Design a visually stimulating experience supported by video content and photography that better conveys WHO HRC is, and how they service their clients throughout the state. Humanize the brand overall and create an additional “careers” section that lends a human element to the overall HRC brand to attract new employee talent. Highlight HRC’s 100 year history of excellence. Place a heavy focus on completed projects throughout the website to assist the sales team in supporting their vast experience in the municipality, industrial, and private sectors. Develop the website on a WordPress CMS so the internal marketing team at HRC can manage their own website content as they see fit once the new site is live. We also developed a 100 year timeline that is highlighted on the top level navigation of the website to tell the story of HRC’s history. This timeline is supported by imagery of each titled event, and is categorized in chronological order starting in 1915 and running to the present. Understanding our clients needs, we developed this in a manner that our end client could easily add events to the timeline with minimal training from our team.